"Reach for the stars" is a computer-generated image. This doesn't mean that it was created from scratch by a computer, only that computers were involved at different stages of its making. Many of the skills - and a few additional ones - required in "traditional" art are also necessary in computer-generated art. 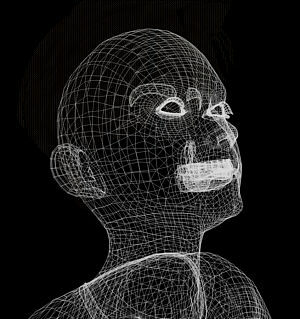 A computer-generated image is buit by placing digital models - virtual 3D sculptures - of real or imaginary objects in a virtual space. These models are defined by numbers, just like music is written with notes, or stories with letters. The skill of the 3D artist consists in creating the models and their environment with all their properties. Once these are defined, the corresponding numerical data are processed and rendered into an image that can be displayed, printed etc. It is customary to call the final image a "render". The whole process is not unlike taking a studio photograph, only that in the case of a computer-generated image both the camera and the scene are virtual. Another analogy can be drawn with music, where a sheet of music is "rendered" by a musician (or a machine). There are several mathematical methods used to render a computer image, and one of them is called ray-tracing. Ray-tracing is known for the high realism of its output, particularly when it comes to calculate reflection and refraction. What is "Persistence of Vision"? Persistence of Vision Raytracer, or POV-Ray for short, is the main software tool used to create "Reach for the stars". POV-Ray can help create high-quality computer graphics and for this has a large following of amateur artists. It can be downloaded free of charge from the www.povray.org website. There are many different ways to create models. In professional 3D, the usual way is to use a special tool called a graphical modeler, where the model is "sculpted" with a mouse or another device. The child of the image, for instance, is a commercial model created by professional 3D sculptors using high-end technology. For "Reach for the stars", however, many models were built by the authors and other members of the POV-Ray community by writing literal descriptions of the objects using common (and less common) words of the English language, like "sphere" or "box" with numerical parameters. This scene description language is specific to POV-Ray. A model must be also "textured", i.e. it must have colours, patterns and finish properties. Creating good textures is another area of 3D that requires various skills. Textures can be defined mathematically, or they can be painted by hand (using traditional media or paint software), or they can be derived from photographs. In "Reach for the stars", the starry background is a mathematical texture, but the picture on the computer is a photograph taken by Mark Shuttleworth. How are the lights and shadows created? In 3D, lights and their effects suchs as shadows or highlights are calculated by the computer. Setting up the lighting, however, is still quite difficult, as in traditional painting and photography. A good part of the time spent on working on the image was dedicated in experimenting with various lighting setups. While "Reach of the stars" has a quite non-photorealistic lighting, the "Museum" section presents some of the models in photorealistic lighting. How long does it take to create an image? "Reach for the stars" was created over a period of 3 months. The authors are hobbyists, so they did it on their leisure time, at night and during the week-ends. It can be assumed that a 100 hours or so were spent on creating the scene. This estimate doesn't take into account the time spent by all the people who created items we just re-used, like models and textures. The scene itself rendered rather quickly, in a few hours. Why are computer resources so critical? 3D graphics use a lot of computer resources, because they need to apply complex calculations to very large amount of data. The rendering of movies like "Ratatouille" or "Shrek" typically requires hundreds of machines linked together in what is called "render farms". The rule of thumb is that the amount of resources needed is correlated to the complexity of the image: a scene with many objects will take longer to render and will used more memory than a scene with only one of the objects. A photorealistic scene where natural lighting is correctly reproduced and where objects show wear and tear will use more resources than the same scene with basic lighting and textures.